I’d like to talk more about the great Ikebana boom during the rapid economic growth period in Japan. To summarise, what I have proposed so far is that the boom was strategically created by a group of people, in a similar way to the creation of a successful commercial brand. Of course, I think that the Ikebana boom is a fantastic cultural phenomenon and it could never happen anywhere else in the world. But why did it happen and why has it now faded? Very few people have investigated these difficult but fascinating questions. As I mentioned, Ikebana at that time had two sales points: as training to become a good house wife and as Western art. What we have to understand here is that these two points were contradictory. According to Mirei Shigemori who influenced many prominent Ikebana artists at that time, Ikebana had become Western art by denying its traditional spiritual aspects. 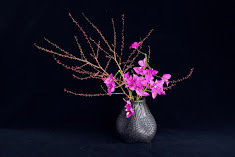 Although the general public expected Ikebana to function as training for young women to learn its spiritual aspects and become good house wives, the new Ikebana in principle did not see the spiritual aspects as important. Once the boom had passed its peak, it is natural that some people started to ask questions about the two sales points of Ikebana. I have already talked about the aspect of the training to become a good house wife. I’ll focus on the artistic aspect of Ikebana from the next issue. November is a busy month for me. My work was selected as a finalist for the Deakin University Contemporary Small Sculpture Award and I will also be preparing a Christmas installation for the City of Ballarat. Please visit my site for the details.